Looking for any and all Champion frames, forks, bars, and pads 20"/24"/26" Let me know what you have. I have an early 80's ?Austrailian? Cobra BMX bike imported to the states by Beacon Cycle. I know B.C. 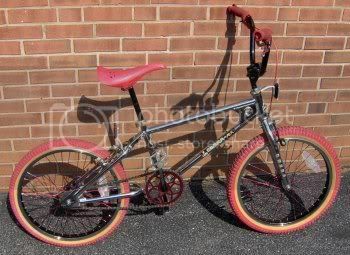 imported bikes, especially French road bikes to the states in the 70's-80's, but does anyone know more info about these bmx bikes? The bike has the Cobra Stickers, but a Beacon Cycle head badge. Cobra BMX bikes were made by the Toowoomba Bicycle Company in Austrailia. I'm just trying to verify that Beacon imported these from Austrailia, or if not, then where? I do not know but I picked up a sticker pack for one do you have any pics of yours? There are hi-rez pictures up on Flickr. They are under Ol' Skool BMX. There is a lowrez pic below. i am also trying to find info on beacon cycle. i recently a sekine road bike as a gift. i believe it was manufactured in the '70s. the bike has the beacon cycle head badge/name on it. any info would be appreciated. I have a great deal of facts about these bikes as I grew up in the town where they were manufactured and right now have one, except mine has a different gusset.IT is identical to the Diamond Back Centurion the frame. I am looking for a complete PK Ripper Looptail or frame for my 9 year old son. I have a 1980's Kuwahara Kz-1 that I wanna sell. It is in amazing condition with mostly original parts. It is blue and chrome and I believe (contrary to my cycle specialist) that it needs a new bracket.either call me at 352-1880, reply, or email me at jordan_smilko@yahoo.com.